On March 29th a screening of the documentary film "Work At Hand, Michael K. Paxton" will be presented at Chaplin Theater at Raleigh Studios 5300 Melrose Avenue Los Angeles, CA. Doors open at 7:00pm, Screening 7:30, following the screening there will be a Q&A with the filmmaker Peter Hartel and artist Michael K. Paxton. 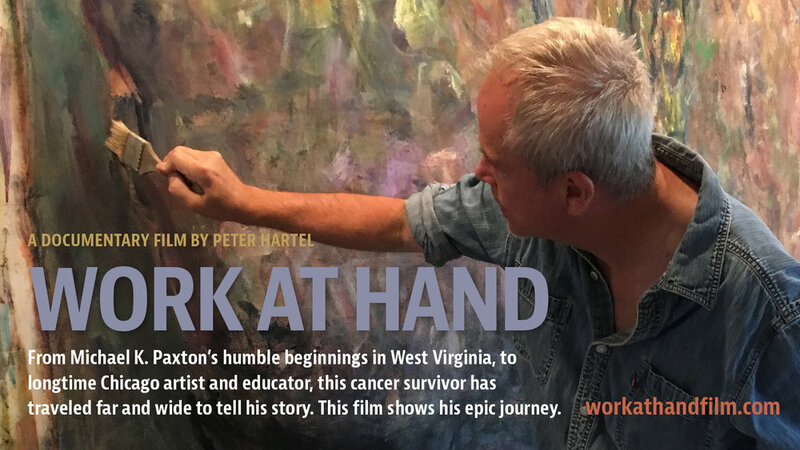 We are excited to announce that there will be a free screening of the documentary film "Work At Hand" Friday, November 30, 2018 at 7:00 pm at Columbia College, Film Row Theater, 1104 S. Wabash Ave., 8th floor. The premiere of "Work At Hand" was an incredible success for our film and the generous staff at Chicago Filmmakers. Thank you to all who attended the screening and also contributed to the Chicago Filmmakers fundraiser. The Chicago premiere of the documentary film "Work At Hand" will be presented by Chicago Filmmakers in two free screenings on Saturday October 20, 2018 at 7:00 PM and 8:30 PM at 5720 North Ridge Avenue, Chicago, IL. Both screenings are free and open to the public. In addition to Michael’s one-person exhibition “Pillars of Dust” and his Visiting Artist stay, Work at Hand” was screened at the Heuser Art Center of Bradley University, Peoria, IL on September 28th as a prelude to the opening of his exhibition. We are are very pleased that Work at Hand is an Official Selection to the 17th Annual Great Lakes International Film Festival 2018 announced yesterday, September 8, 2018. Looking forward to the September 21st, 7:00pm, screening at the historical Wealthy Theater in Grand Rapids, MI. Here is the new poster for the documentary film "Work at Hand" that Jeanne Nemcek has designed and will be used for the first time for the September 21, 2018 7pm showing at the Wealthy Theater in Grand Rapids, MI, as well for other screenings to follow that will be announced soon. Peter Hartel, Director/Producer, pictured here on the Ohio River in Huntington, WV during filming, is happy to announce that there will be a showing of the documentary film "Work At Hand Michael K. Paxton" Friday, September 21, 2018 at 7:00 pm at the Wealthy Theater, 1130 Wealthy Street SE, Grand Rapids, Michigan. A discussion of the film with the filmmakers and artist will follow the screening. Copyright © 2019 Peter Hartel. All rights reserved.